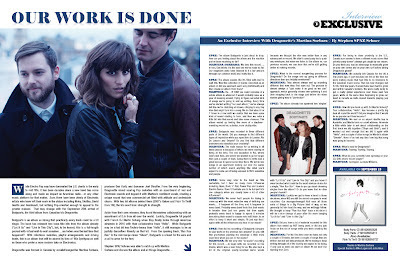 Discussions Magazine Music Blog: An EXCLUSIVE Interview with DRAGONETTE! 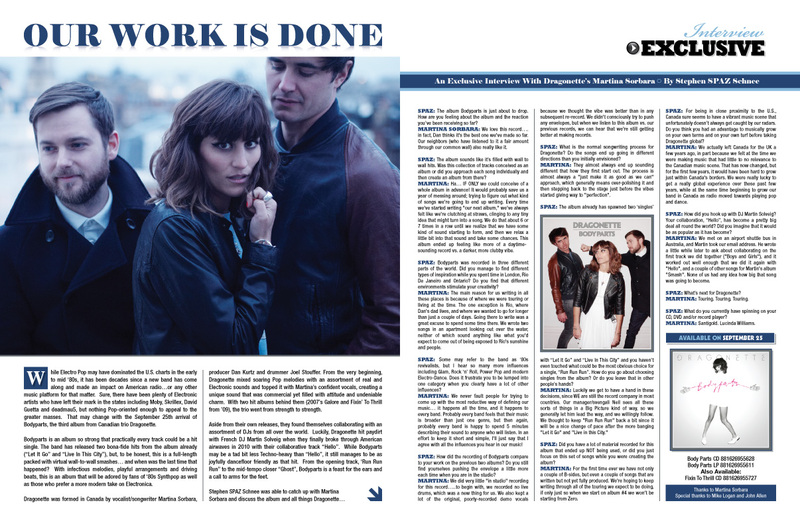 An EXCLUSIVE Interview with DRAGONETTE! While Electro Pop may have dominated the U.S. charts in the early to mid ‘80s, it has been decades since a new band has come along and made an impact on American radio…or any other music platform for that matter. Sure, there have been plenty of Electronic artists who have left their mark in the states including Moby, Skrillex, David Guetta and deadmau5, but nothing Pop-oriented enough to appeal to the greater masses. 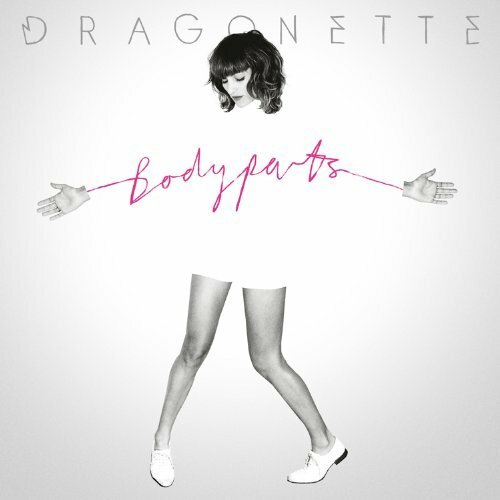 That may change with the September 25th arrival of Bodyparts, the third album from Canadian trio Dragonette. Bodyparts is an album so strong that practically every track could be a hit single. The band has released two bona-fide hits from the album already (“Let It Go” and “Live In This City”), but, to be honest, this is a full-length packed with virtual wall-to-wall smashes… and when was the last time that happened? With infectious melodies, playful arrangements and driving beats, this is an album that will be adored by fans of ‘80s Synthpop as well as those who prefer a more modern take on Electronica. Dragonette was formed in Canada by vocalist/songwriter Martina Sorbara, producer Dan Kurtz and drummer Joel Stouffer. From the very beginning, Dragonette mixed soaring Pop melodies with an assortment of real and Electronic sounds and topped it with Martina’s confident vocals, creating a unique sound that was commercial yet filled with attitude and undeniable charm. With two hit albums behind them (2007’s Galore and Fixin’ To Thrill from ’09), the trio went from strength to strength. Aside from their own releases, they found themselves collaborating with an assortment of DJs from all over the world. Luckily, Dragonette hit paydirt with French DJ Martin Solveig when they finally broke through American airwaves in 2010 with their collaborative track “Hello”. While Bodyparts may be a tad bit less Techno-heavy than “Hello”, it still manages to be as joyfully dancefloor friendly as that hit. From the opening track, ‘Run Run Run” to the mid-tempo closer “Ghost”, Bodyparts is a feast for the ears and a call to arms for the feet. SPAZ: The album Bodyparts is just about to drop. How are you feeling about the album and the reaction you’ve been receiving so far? MARTINA SORBARA: We love this record…. in fact, Dan thinks it's the best one we've made so far. Our neighbors (who have listened to it a fair amount through our common wall) also really like it. SPAZ: The album sounds like it’s filled with wall to wall hits. Was this collection of tracks conceived as an album or did you approach each song individually and then create an album from there? MARTINA: Ha… IF ONLY we could conceive of a whole album in advance! It would probably save us a year of messing around; trying to figure out what kind of songs we're going to end up writing. Every time we've started writing "our next album," we've always felt like we're clutching at straws, clinging to any tiny idea that might turn into a song. We do that about 6 or 7 times in a row until we realize that we have some kind of sound starting to form, and then we relax a little bit into that sound and take some chances. This album ended up feeling like more of a daytime-sounding record vs. a darker, more clubby vibe. SPAZ: Bodyparts was recorded in three different parts of the world. Did you manage to find different types of inspiration while you spent time in London, Rio De Janeiro and Ontario? Do you find that different environments stimulate your creativity? MARTINA: The main reason for us writing in all these places is because of where we were touring or living at the time. The one exception is Rio, where Dan's dad lives, and where we wanted to go for longer than just a couple of days. Going there to write was a great excuse to spend some time there. We wrote two songs in an apartment looking out over the water, neither of which sound anything like what you'd expect to come out of being exposed to Rio's sunshine and people. SPAZ: Some may refer to the band as ‘80s revivalists, but I hear so many more influences including Glam, Rock ‘n’ Roll, Power Pop and modern Electro-Dance. Does it frustrate you to be lumped into one category when you clearly have a lot of other influences? MARTINA: We never fault people for trying to come up with the most reductive way of defining our music… it happens all the time, and it happens to every band. Probably every band feels that their music is broader than just one genre, but then again, probably every band is happy to spend 5 minutes describing their sound to anyone who will listen. In an effort to keep it short and simple, I'll just say that I agree with all the influences you hear in our music! SPAZ: How did the recording of Bodyparts compare to your work on the previous two albums? Do you still find yourselves pushing the envelope a little more each time when you are in the studio? MARTINA: We did very little "in studio" recording for this record…..to begin with, we recorded no live drums, which was a new thing for us. We also kept a lot of the original, poorly-recorded demo vocals because we thought the vibe was better than in any subsequent re-record. We didn't consciously try to push any envelopes, but when we listen to this album vs. our previous records, we can hear that we're still getting better at making records. SPAZ: What is the normal songwriting process for Dragonette? Do the songs end up going in different directions than you initially envisioned? MARTINA: They almost always end up sounding different that how they first start out. The process is almost always a "just make it as good as we can" approach, which generally means over-polishing it and then stepping back to the stage just before the vibes started giving way to "perfection". SPAZ: The album already has spawned two ‘singles’ with “Let It Go” and “Live In This City” and you haven’t even touched what could be the most obvious choice for a single, “Run Run Run”. How do you go about choosing singles from the album? Or do you leave that in other people’s hands? MARTINA: Luckily we get to have a hand in these decisions, since WE are still the record company in most countries. Our manager/svengali Neil sees all these sorts of things in a Big Picture kind of way, so we generally let him lead the way, and we willingly follow. We thought to keep "Run Run Run" back a bit since it will be a nice change of pace after the more banging "Let it Go" and "Live in this City." SPAZ: Did you have a lot of material recorded for this album that ended up NOT being used, or did you just focus on this set of songs while you were creating the album? MARTINA: For the first time ever we have not only a couple of B-sides, but even a couple of songs that are written but not yet fully produced. We're hoping to keep writing through all of the touring we expect to be doing, if only just so when we start on album #4 we won't be starting from Zero. SPAZ: For being in close proximity to the U.S., Canada sure seems to have a vibrant music scene that unfortunately doesn’t always get caught by our radars. Do you think you had an advantage to musically grow on your own terms and on your own turf before taking Dragonette global? MARTINA: We actually left Canada for the UK a few years ago, in part because we felt at the time we were making music that had little to no relevance to the Canadian music scene. That has now changed, but for the first few years, it would have been hard to grow just within Canada's borders. We were really lucky to get a really global experience over these past few years, while at the same time beginning to grow our band in Canada as radio moved towards playing pop and dance. SPAZ: How did you hook up with DJ Martin Solveig? Your collaboration, “Hello”, has become a pretty big deal all round the world? Did you imagine that it would be as popular as it has become? MARTINA: We met on an airport shuttle bus in Australia, and Martin took our email address. He wrote a little while later to ask about collaborating on the first track we did together ("Boys and Girls"), and it worked out well enough that we did it again with "Hello", and a couple of other songs for Martin's album "Smash". None of us had any idea how big that song was going to become. SPAZ: What’s next for Dragonette? SPAZ: What do you currently have spinning on your CD, DVD and/or record player?